This year, a few courses haven't merely entered our Top 100 lists, they've rocketed into the upper ranks. There are 11 rookies in all, including a mirage of a links in the Middle East. Seeing is believing, so c'mon, take a look. No. 29 — Tara Iti New Zealand, Tom Doak, 2015 During construction of Tara Iti, Tom Doak said he would have failed as an architect if the course didn't end up as one of the top 50 in the world. That's how special the site was. Rest assured, Tom, your reputation is intact. Tara Iti jumps onto our World list as one of our highest debuting courses ever—for good reason. Set on New Zealand's North Island, just 50 miles north of downtown Auckland, the barely two-year-old course is already acknowledged as the Southern Hemisphere's premier links. 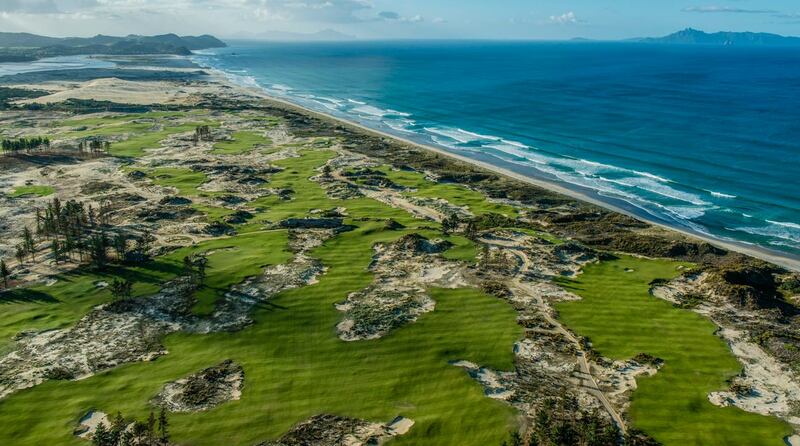 Its enviable location in the dunes along the Pacific Ocean and Hauraki Gulf, along with superior fine-fescue fairways and meticulously sculpted swirls of natural grass and sand, have some reviewers saying it could host an Open Championship tomorrow—if only it were 11,000 miles farther northwest. A front nine on calm, treeless terrain with just one par 3 and a lone par 5 pairs with a heaving back nine dotted with a trio of par 3s and two par 5s. 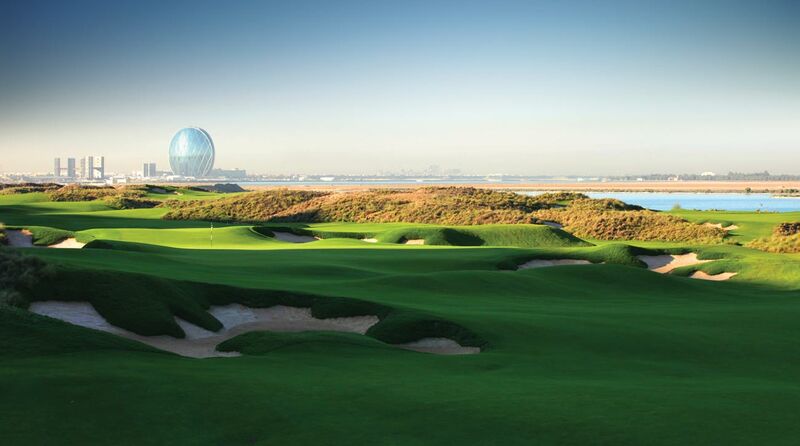 Among the candidates in the "best hole" department are the 290-yard, par-4 seventh, a drivable test with a large dune framing a wildly contoured green, and the 160-yard, par-3 17th, its foreground flecked with sandy waste areas and its background a mesmerizing view of mountain and sea. Tara Iti is named for the endangered New Zealand fairy tern. Both occupy rarefied air. No. 50 — Cabot Cliffs Inverness, Nova Scotia, Canada, Bill Coore/Ben Crenshaw, 2016 Newly minted as Canada's top-ranked course, this year-old Bill Coore/Ben Crenshaw design is deep in the heart of lobster country, a three-and-a-half-hour drive from Halifax, Nova Scotia's capital. The second course at the Cabot Links resort rests on higher ground than its predecessor, notably at the north end of the property, where it towers more than 100 feet above the Gulf of St. Lawrence, inspiring Pebble Beach–like awe. The south-end holes are tucked closer to the beach, akin to a traditional Scottish links. But variety is everywhere, as evidenced by Cabot Cliffs' unusual sequencing, which features three par 3s, three par 4s and three par 5s on each nine. Most memorable is the trio of stunning closing holes, beginning with the 176-yard, par-3 16th (above), a beauty that Matt Kuchar compared to Cypress Point. Pebble? Cypress? With namechecks like that, it's no surprise that Cabot Cliffs debuts in the top 50. Tasmania, Australia, Mike DeVries/Darius Oliver, 2015 American architect Mike DeVries, best known for his Michigan standouts, the Kingsley Club and Greywalls at Marquette Golf Club, teamed with Aussie course critic Darius Oliver to create a pulse-racing layout on Australia's King Island, nestled between Tasmania and Melbourne. Highlights of this two-year-old track include eight holes along Bass Strait, a lighthouse in view at holes 14 through 18, and massive, seriously-in-play sand dunes and coarse ridges. Without a doubt the most spectacular-looking of our Top 100 rookies (and that's saying a lot), Wickham wows with an opening stretch of seaside headland holes, three par 3s (Nos. 3, 11 and 17) that skirt the sea and a "Cape"-style 18th that demands a bite-off-as-much-as-you-dare drive over Victoria Cove. Typically buffeted by strong breezes—a drawback for some of our reviewers—Wickham compensates with wide landing areas, because it's all about fun Down Under. No. 91 — Yas Links Abu Dhabi, U.A.E., Kyle Phillips, 2010 Yas Links bursts with originality, as befits the first course in the Middle East to crack the Top 100. "[Architect] Kyle Phillips created a genuine links course in the desert," Graeme McDowell said after a Pro-Am here in 2011. "Sometimes you can close your eyes and think you're on Kingsbarns [in Scotland]," another of the designer's gems. Phillips literally created the coastline that edges this 7,394-yard layout, dredging 2.3 million cubic yards of fill from the sea. Yas Links is carpeted in Platinum paspalum (perfect for linksy lies) and peppered with 109 bunkers. Most unforgettable is the closing stretch, where five of the final six holes ease past the Arabian Gulf. No. 100 — Prestwick Prestwick, Scotland, Old Tom Morris 1851/1883 A quirkier course than even fan-fave North Berwick, Prestwick has always had fierce admirers—and fierce critics, who deem its archaic eccentricities relics best confined to another era. But atmosphere, ambience and renewed appreciation of its historical features have finally nudged Prestwick into the ranks of the elite. In 1851, Old Tom Morris left his St. Andrews home to design a 12-hole links for Prestwick, in the west of Scotland. Three decades later, he helped the club expand the course to 18 holes. Its opener is one of the strangest in golf, with a stone wall and railway flush along the right side. Still standing are other Old Tom oddities, like the par-5 third ("Cardinal") and par-4 13th ("Sea Headrig"). Equal parts weird and wonderful, this host to 24 Open Championships (including the first 12) has earned its Top 100 nod—at last. No. 52 — Sand Valley Nekoosa, WI, Bill Coore/Ben Crenshaw, 2017 Turn Bandon Dunes's Mike Keiser loose on a rumpled sandy parcel that's ideally suited for golf, then pair him with the design talents of Bill Coore and Ben Crenshaw, and it's no surprise that the results are wildly successful. Situated on a huge natural sand deposit 170 miles northwest of Milwaukee, the aptly named Sand Valley earns honors as our highest debuting U.S. course for one essential reason: The sand, man! The course's gritty subsurface makes for great walking and furnishes ground-game options in the spirit of Scottish links, but the look more resembles English heathland, with shrubs and trees dotting the sand that flanks the playing areas. That said, the course—with dunes and ridges that reach 60 feet—defies easy categorization. What it possesses in abundance are superb golf holes sprinkled throughout the hilly, par-35 front nine and along the flatter, par-37 back nine. The quintet of par 3s is especially memorable, and there are few more evocative closers than the 523-yard, par-5 18th, which climbs past a soaring dune on the left and a vast sand valley on the right. With its modest 128 slope from the back tee, Sand Valley represents yet another Top 100 newbie that emphasizes variety, playability and rollicking fun over one-dimensional golf. No. 74 — Erin Hills Erin, WI, Michael Hurdzan/Dana Fry/Ron Whitten, 2006 Reappearing on the list after dropping off in 2015, Erin Hills enjoys its highest ranking ever, no doubt owing to its enthusiastic reception as host of the 2017 U.S. Open, a hail of hosannas that no doubt gave our raters the green light to once again acknowledge the track's many virtues. This "heartland" design by architects Michael Hurdzan, Dana Fry and Ron Whitten looks like a links, and at time plays like one. Its semi-blind drives, fast-running, fescue-framed fairways, typically strong breezes, heavily undulated terrain and absence of trees are all linkslike traits. But it isn't quite a links, as evidenced by All-American bentgrass greens that are more receptive to aerial assaults than run-ups. What impressed our panelists, as well as the pros, was Erin's astonishing diversity. Brutish par 4s like the third, fifth and 10th contrast perfectly with potentially drivable greens at holes 2 and 15. The monster par-3 sixth is balanced by the petite, terror-inducing ninth. The par-4 fourth and par-4 12th, natural lay-of-the-land holes, demand both thoughtful strategy and precise execution. Most course connoisseurs—and the USGA—would prefer Erin Hills to play slightly firmer, with more wind to offer its best test, but our panelists voted for the magnificent design itself, which like Open champ Brooks Koepka, emerged as a winner. No. 86 — Philadelphia Cricket Club (Wissahuckon) Flourtown, PA, A.W. Tillinghast, 1922 Golden Age great A.W. Tillinghast crafted Philly Cricket in 1922. While it never quite measured up to Northeast pillars such as Winged Foot and Baltusrol, it was intended from the start to be special. After all, it was Tillie's home club. Historians conclude that he never got the chance to implement planned additions, leaving the course just shy of greatness. Renamed Wissahickon in 2002, after the creek that crosses it several times, Tillinghast's design suffered further from overgrown trees and out-of-place bunkers. That all changed in 2013, when architect Keith Foster began restoring the layout to its glory days—and then some. More than a thousand trees were removed, replaced by golden fescue grasses and newly expansive views of the rolling property. Angles were reemphasized, as were green and fairway tilts. Bunkers were reworked, notably at the par-5 seventh, where 13 of them comprise Tillinghast's "great hazard" concept, as practiced at Baltusrol (Lower) and Baltimore Country Club. The 487-yard, par-4 18th, with its approach over Wissahickon Creek, remains one of the game's great finishing holes. As a testament to its character, the course played host to the 2016 Constellation Senior Players Championship, where Bernhard Langer scratched out a one-over-par win. Tillinghast, whose ashes were spread into Wissahickon Creek in 1942, surely smiled at the way his home track acquitted itself. No. 89 — Moraine Country Club Dayton, OH, Alex "Nipper" Campbell, 1930/Keith Foster, 2016 Byron Nelson won his fifth and final major, the 1945 PGA Championship, at Ohio's Moraine Country Club, in Dayton. Afterward, the course drifted from the national spotlight. But restoration specialist Keith Foster, together with club superintendent Jason Mahl, has restored the luster to Alex "Nipper" Campbell's 1930 design by removing 2,000 trees, resodding and widening fairways, reconstructing bunkers and greens and improving drainage so the course now plays as firm and fast as Troon native Campbell had intended. Foster also tweaked three replacement holes (3, 12 and 15) built post-1930 and dovetailed them into the original design. Today, the tumbling, 7,270-yard layout rolls over brilliantly rippled fairways, with ground-based approaches an option into nearly every stoutly bunkered green. The short, downhill par-4 16th perfectly embodies the testy terrain and slew of strategic choices to be found at Moraine. No. 94 — Monterey Peninsula Country Club (Dunes) Pebble Beach, CA, Seth Raynor, 1926/Tom Fazio/Tim Jackson/David Kahn, 2016 Eight years after its sibling, the Shore course, catapulted into the Top 100, the Monterey Peninsula Country Club's Dunes course has joined the ranks. Blessed with great bones and a remarkable architectural pedigree, the Dunes was a co-host to the PGA Tour's Bing Crosby Pro-Am (now the AT&T Pebble Beach National Pro-Am) from 1947 to 1964. Design legend Seth Raynor created the Dunes, but he died early in construction, in 1926, leaving the project in the hands of Alister MacKenzie and Robert Hunter, the more than capable men working next door at Cypress Point. But even with its dunes, ocean holes, majestic trees and prancing deer, the course never quite realized its potential, even after some Rees Jones alterations in 1998. Enter Tom Fazio and his son Logan, who, a few years ago, teamed with former associates Tim Jackson and David Kahn for an extreme makeover. Reopened in 2016, the Dunes isn't universally beloved, but those who admire the redo—which, among other changes, involved resizing and recontouring the greens, enhancing existing dunescapes and adding others—are enthusiastic enough to have pushed the course into the Top 100. The Shore, which got its own makeover in 2004, is still ranked higher, but for the Dunes the chase is now on. No. 96 — Sleepy Hollow Briarcliff Manor, NY, Macdonald-Raynor, 1911, A.W. Tillinghast, 1928, Gil Hanse, 2007 Home to one of the great clubhouses in golf (a former Vanderbilt mansion), as well as to one of the game's most memorable logos (the Headless Horseman), Sleepy Hollow also boasts a phenomenal 1911 C.B. Macdonald layout, complete with classic template holes, including a Reverse Redan, a Punchbowl and a Double Plateau. In 1928, A.W. Tillinghast revised several holes and added seven others. Since 2006, Gil Hanse has worked to restore original design features in the contouring and scale of the greens and bunkers, and to blend the Tillie holes into more of a Macdonald style. The Hanse team's tree-removal efforts, particularly on the standout par-3 16th, have brought grandeur back to Sleepy Hollow's Hudson River views. The course has been rising through the ranks for several years, finishing just five-hundredths of a point from U.S. Top 100 glory in 2015. In 2017, it finally makes good on the legend of Sleepy Hollow.